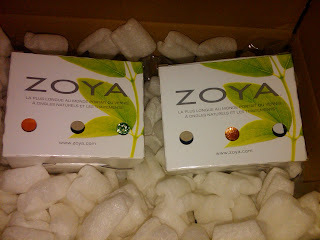 ~Polish Freshie~: The Zoya's Have Arrived! I hope everyone had a safe and wonderful holiday! 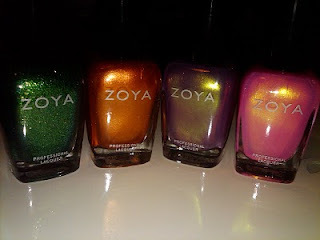 My Zoya haul came in last Wednesday but I haven't had a chance to post them yet. Yes I realize the second set is completely orange-happy - Gabrielle and Annie looked very different on my monitor. I picked Gabrielle for a very specific reason which will be a later post. 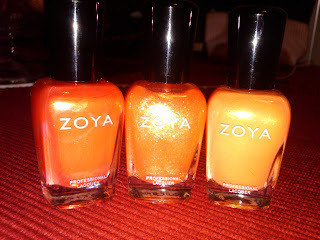 I'll swatch these together for a comparison this week so stay tuned! Oooo I love your pretties! YAY! Don't you love new stuff? ShortAndSweet, I love online shopping even if I know it's coming it's like Christmas when I open the packages!! Very cool! Cant wait to see swatches!! !